Dali's paintings make a great intro to surrealism and modern art. Look at this one. 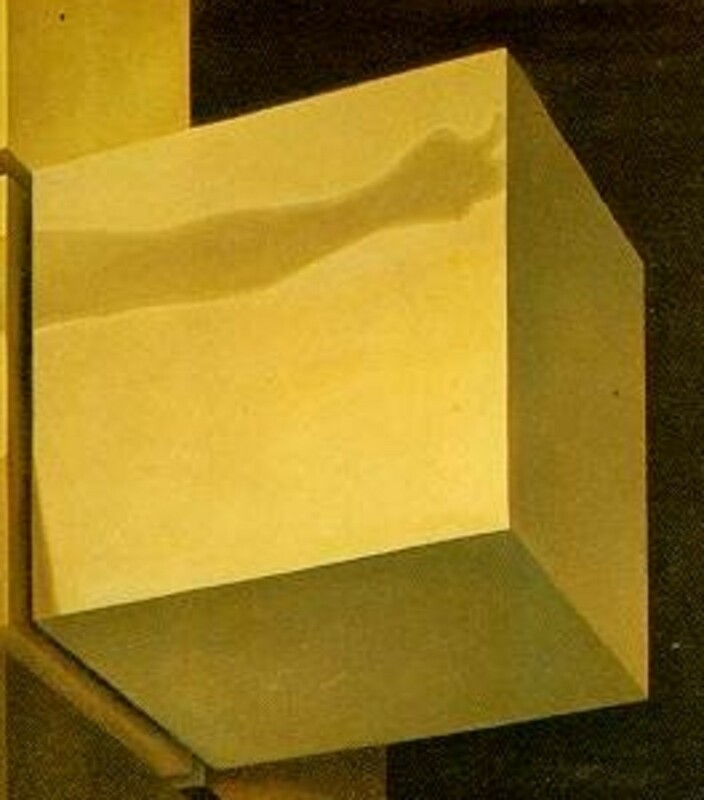 If not for the cubes, Crucifixion (Corpus Hypercubus) would look, at first glance, like an old master's piece. 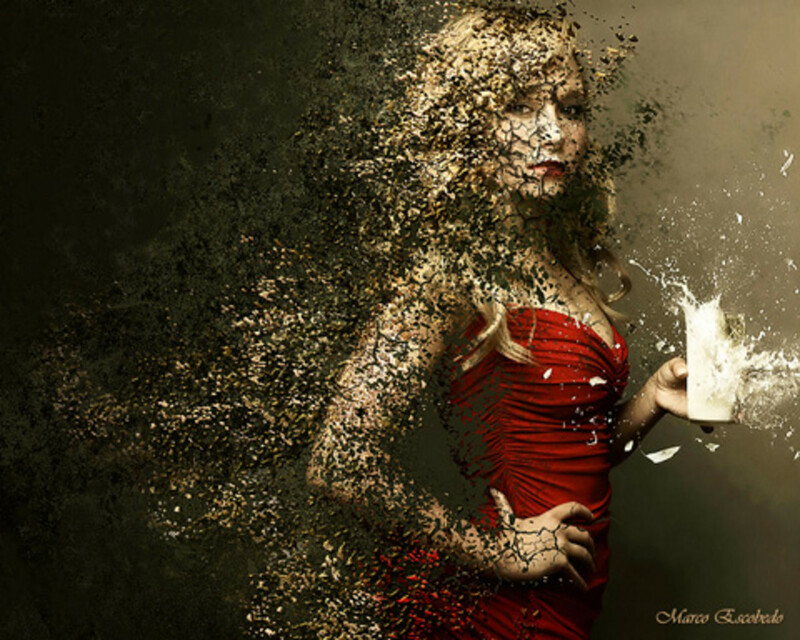 Surrealism is the rendering of dreams in literature, art or music. Surrealists were influenced by that old Freud, Sigmund. Dali's brand of surrealism consisted of double images, floating objects, morphs....the stuff of dreams. For example, he has painted self-portraits on one of the knees of the crucified Christ, and the cubic cross floats above a giant chessboard. His wife, Gala, stands beside the cross, possibly standing for Mary Magdalene. What say, Dan Brown? The cube motif is everywhere. Gala stands on one, the floor has black and white squares, and the four cubic nails form a square. Does the hypercube symbolise space-time? 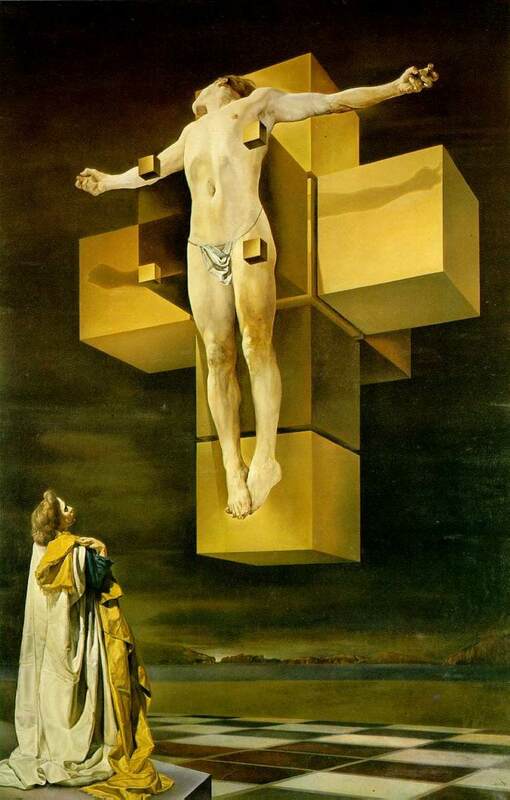 Does Dali mean that Christ is the Lord for all eternity, not bound by the limitations of time? He rose on the third day, didn't He? That message is rendered as a visual oxymoron. 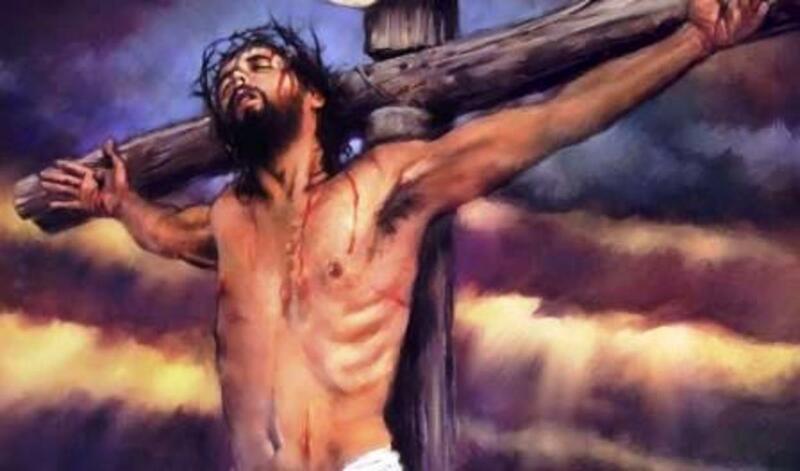 The world was given a Christ and they crucified Him. But did he stay transfixed? Only in images and sculptures. On the third day, He chose to transcend space time and rose. 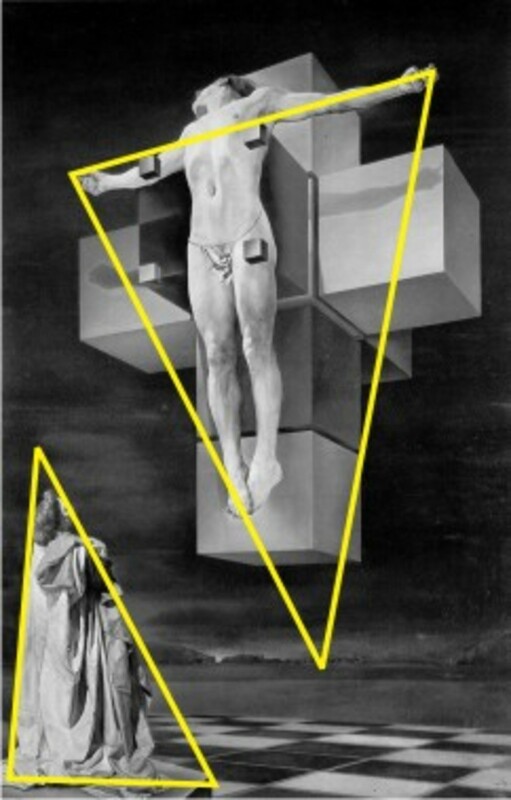 Here, Dali shows Him fixed to the cross, but not fixed. He levitates, and projects Himself. Rising above His mortal avatar, His suffering, the earth's gravity, hate, war, death, passions...everything. Get it? The buoyancy of Absolute Love versus the gravity of hate. I love Dali's dreamy lighting. That's half the secret of the timelessness of his paintings. You can stand there looking at it for hours, and it can seem like a minute to you. Or possibly days. The light contributes to that effect, along with the geometrical composition. I learnt to draw shadows from this picture. Look at the detail where I zoomed up the shadow of the hand. Crisp shadows, almost like Caravaggio's. Except they are not dark, but more realistic. By now, after the Last Supper you must be quite an expert at finding out the hidden geometry of visual art? You are a great student of Art! Come here, please, and discover for yourself before reading what I think. Click on image to view bigger and better. Well, see if we match. If we do, then we congratulate each other. If we don't we learn from each other! There is a heavy vertical grid, obviously by the presence of the cubes. Vertical lines, subliminally evoke feelings of stability, monuments, edifices, spiritual progress...Why? Think about it. The horizontal lines add to the stability of earthy matters. And provides a base for the subject. There are two triangles formed if you notice. From the Last Supper, you know that triangles mean stability and security. But not when they are inverted! The inverted triangle creates a feeling of tension and uneasiness inside us. Like a big cone about to topple. Here Christ is an inverted triangle, designed to create a little tension and dynamism in the picture. See? To illustrate this concept further, I show you another crucifixion Dali did. See the inverted triangle? That's the painting I'm going to do next time. By which time, you will all be experts at reading the secret geometry of art. Praise be to God. .After that, since you have been a good student, gentle reader, I give you a light break. Enjoy the video! "But not when they are inverted! The inverted triangle creates a feeling of tension and uneasiness inside us." Actually the inverted triangles refer to the feminine... sets a whole other take on that..
a bumper sticker: "VAGAL STIMULATION IS AS EFFECTIVE AS LSD". The "chakras"
been called the Sahasrara Chakra. inhibitory neurons caused by scar tissue in the parasympathetic nervous system. Kundalini, and schizophrenia are all the same thing, an overactive brain. and thereby replaced LSD for the Clockwork Orange treatment. I went to a Dali exhibit a few years ago in Philly. It was really cool. There were interesting features like having one of Dali's non painted works on display. It was a model of the Crucifixion where you had to look through something similar to a spy glass. It made a really interesting surreal 3-D effect. 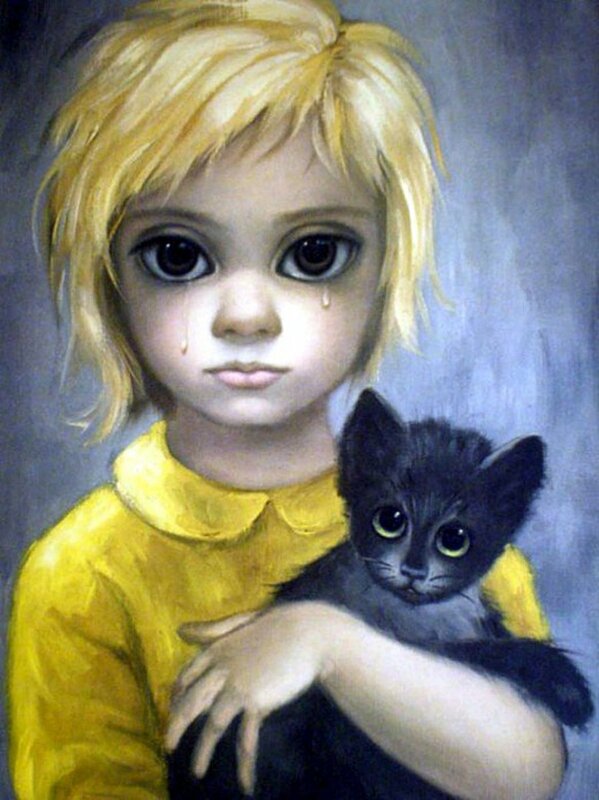 He is a fascinating artist and I have seen some of his works in person, which was awesome. Good article. I've always seen this as a complex depiction of man's need to deconstruct his ego (achieved symbolically through destruction of the object, the physical as such) before being able to reach God. You can feel the tension between the mini cubes and the body, as if the whole thing is about to split into a million different cubes. I am overwhelmed by your comment and blessing, Onceuponatime! Art speaks volumes due to many reasons, and one is that a piece of art changes with who is in its presence and his or her personal interpretation. 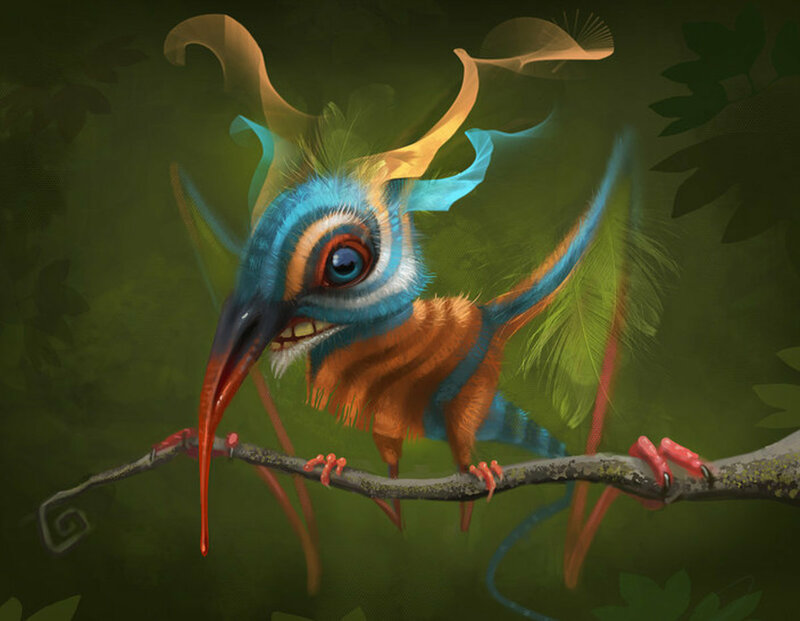 Since I am a newbie, and came across your art this is by far amazing work. Since I believe in Christ, this really inspired me and my ways. I truly believe that art speaks in volumes. Be true to myself, is the message it gave me today. May you be blessed as you bless others though your inspirational art and hubs. Wonderful hub, Kenny. Love the lighting and the sense of suspension - thank you for sharing the geometrical angle to the paintings! 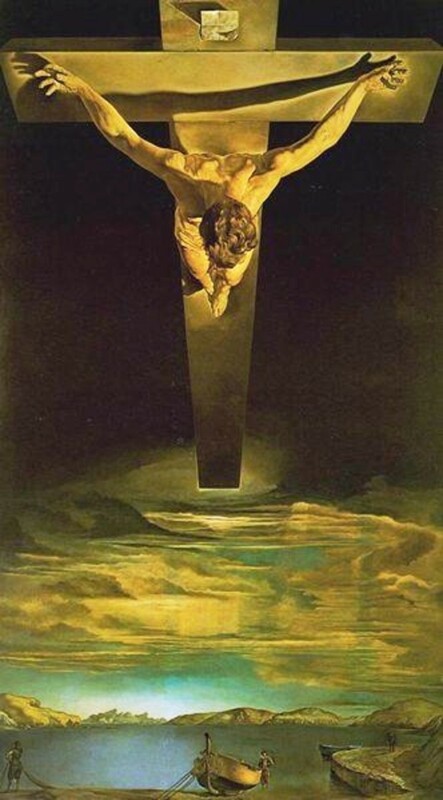 Do you know of anywhere I might find more interpretations on the crucifixion by Dali? What I am trying to find is a comparison between realistic and dreamlike elements. Crucifixion - I notice a couple of things here. First, there are no nails attaching him physically to the cross, which could represent a perfect ascension. Dali must have really liked mathematics, it fascinates me that he uses the hypercube here, in this case the three dimensional (unfolded) version of a four dimensional object, representing the fifth dimension, or as you said, a higher plane of existence, that since the development of sting theory in physics (and later M-Theory) is really a hot button for modern day physicists, especially the more philosophical ones. 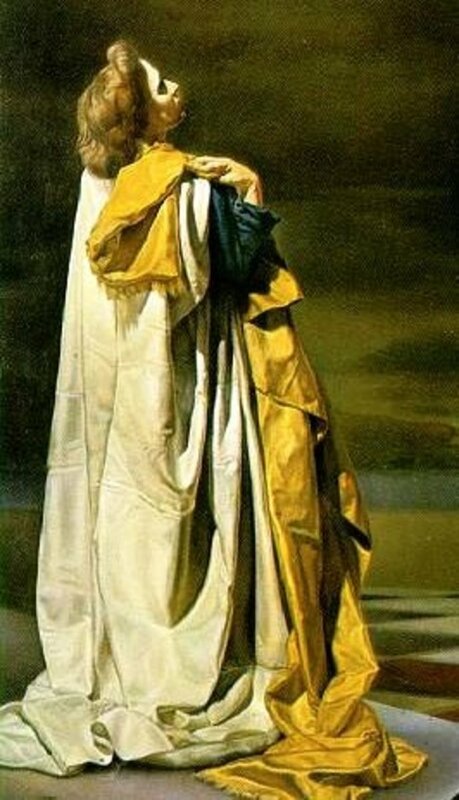 Kenny ,I have been a fan of Dali for ages but have not had the privelage of studying this painting with such detail. I had no idea that the on looker was his wife. I join everyone else in thanking you for passing on your knowledge :-) and I have become an instant fan. Thank you for making me feel buoyant! Beautiful and informative, very interesting! I especially clung to 'the bouyancy of Absolute Love". Thank you for this wonderful hub! Just discovered your writing and since you labeled this as your favorite or best, I started reading this hub first. I love art and create some. Now I know what a treat I have in store for me in reading more of your hubs. You also have a new fan. Sheyd, I am honoured! And delighted, of course! "I have to say, I am beginning to love looking at paintings differently. And that's because of you." - that is what I wanted to achieve, so thank you for making me feel so great! 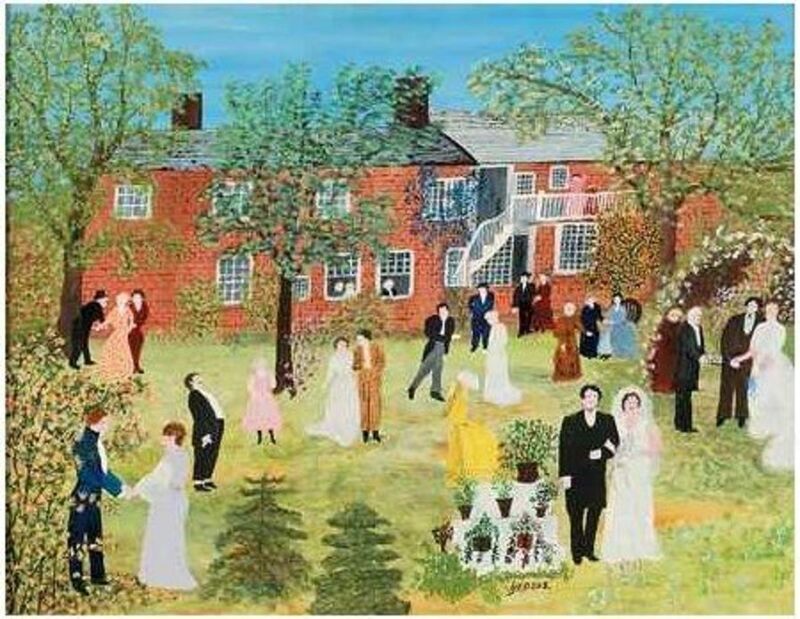 I would like to thank you for one great information about this painting. Actually, we have this group exam and we have to analyze this particular painting. And I have to admit, your hub will really help us. Aside from your help for our exam. You did make me realize how wonderful art is. Before reading your hub, I completely had no idea about this painting. But through you, I did understand things. I am also inspired by the hideen meanings in this painting. I have to say, I am beginning to lovelooking at paintings differently. And that's because of you. Thank you for reading it, Perfumer! Thank you for such a great inspirational hub Kenny! Just like you welcome everybody into art through the door of poetry, O Paraglider! Thanks for the comment, I'm honoured. Keep up the great work - you do this so well! Juliet, thank you for these very kind comments. I do my best when I work for children, so I hope they are as beautiful as you say. I learnt a lot of things from my visitors, too; I'm truly fortunate. Surrealism allows us to give form to our subconscious visions and touch other minds, too. Whatever Dali wants to say does not matter when we look at his work, possess it and enjoy it with our interpretations. Surrealism has always been one of my favorites- in fact some of my artwork, especially in the earlier days- was definitely surreal-There is something so much deeper than meets the eye-there is hidden meaning that sometimes we can pick up- or sometimes only the artist knows what he meant to say and we never know what the true intention was.Dali is one of my favorite artists- and this is a beautiful painting.Great hub! Donna, I am delighted to have made a difference in the way you look at art. No doubt you will share that attitude with people you touch, too! Thank you. Kenny, I will never look at another picture by Dali in quite the same way. Now I will be looking for shapes and meanings, not just at the picture. Thanks that was fascinating. Thank you and welcome to my hubs, Friend. Why don't you also write here? Dear Friend thanks for all that. i wish you for all great work its wonderful i dont know how to tell. your analysis is very great. I really enjoyed this insight into Dali, I'll keep an eye out for your other hubs. Thanks for the visit, thumbs up and calling this hub fantastic, Angela. 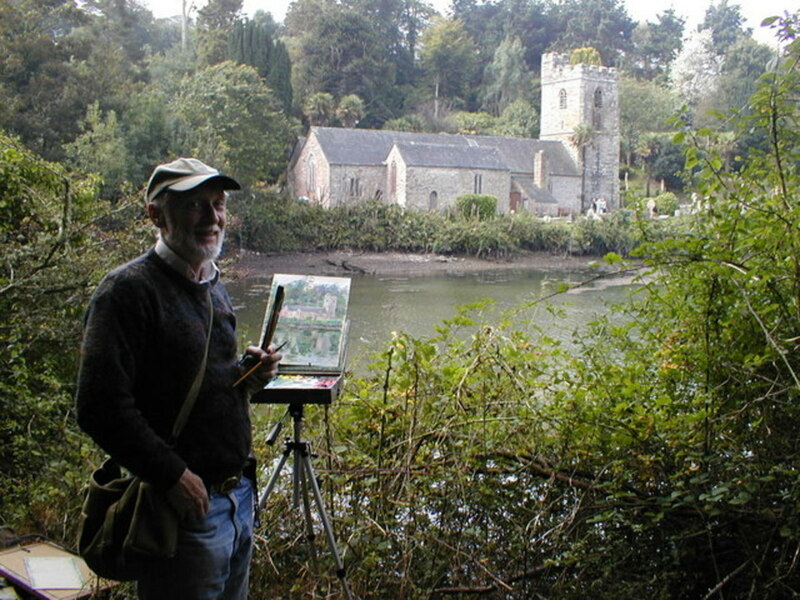 Delighted that you like it so much, and hope you take a look at my other art hubs. Wow, this is fantastic. Please keep enlightening me. By the way, I gave you a thumbs up for such an excellent hub. Thank you, Mary, for feeling that this hub helped you relive the experience. Went to the Dali Exhibit at the Philadelphia Art Museum a couple years ago with my 10 year old son and my hubbie. It was an amazing experience to see the art of Dali so closely. This hub and your insights as well as the great comments brought the experience back to me in shivers! Thank you! Best, Mary g.
is it the fact that you are an atheist that helps you analyse christ on the cross (without blinking your eye lid)? Thank you for sharing that experience, Laurie. Dali's Last Supper is wonderful, in the real sense of the word. Do you want to do a hub on that? If you do, I'll link it to this for the benefit of my visitors. Beyond being struck by a Monet from about 60 feet away - when I went downstairs (into the tunnel that connects the two museums) I gasped. There above the staircase, was the Last Supper - Dali's Last Supper - which is like and unlike Leonardo's. Aw, what is the use of an insight if it's not shared? Your comment has buoyed me up, thanks, Joni! &gt;The buoyancy of Absolute Love versus the gravity of hate. Thanks for posting this hub. Your insight has delighted me. Hehe, Retro Mama, this is my secret side, like Mr Hyde! Thanks for a unique comment! Wow, you are pretty intense for a children's book illustrator! Really great hub, I love Dali. Rmr, thank you. Think I'll do that, too, soon. Tin, thanks for the appreciation. and gaining their own unique insights. I don't know much about art, but I do love Dali. I'd love to hear your take on Persistence of Memory. If Dali had been alive he would be impressed with your explanation, not everyone can deduce it. Great painting and analysis. Cheers. Thank you Sim! Hope you read the next one on Dali, too. I really enjoyed this insight into Dali, I'll keep an eye out for your other hubs. I&eth;unn, hope that's a good thing,and you can flowr out whenever you want to. Free Burgundy! Kenny look at all the comments you have here.I am speechless.I can comment on the art part but I know very less about Christianity,though my best friend is a true Christian.I am trying to learn.Thanks for all the info.Geat hub! rose petals are warm, kenny, warm and sweet. they taste like burgundy wine. Wonderful, I&eth;unn, wonderful! I am delighted. miracles. the rose-coloured glasses replaced, the smiles all real, and miracles raining from the heavens infusing my soul with rose-petals and thoughts of poetry about love. And I'm humbled and honoured by that! Thank you, Nana! I have truly been edified today. I missed the ship one! :( Now'll go check your pic in your profile, a bigger and brighter G-Ma! Paraglider, thank you for that nugget of information. I didn't know all that, this is much appreciated. Did you know you were very lucky? I haven't seen any of the paintings I talk about, live. Frank, it's my pleasure to kindly stun you. G-Ma, please post more photos. Kenny you have stun me and surpassed yourself. Great work, again. The Christ of St John of the Cross is probably the first painting I was consciously aware of. We used to live not too far from Glasgow and often went to the Kelvingrove Museum (usually just called the Art Gallery by the locals). I'm talking about the 50s, when the painting was pretty new. For years, they hung it not in a gallery, but at the top of the main staircase leading up from the museum floor to the art floor. The setting was magnificent and the strong symmetry of the Victorian architecture was the perfect background, extension almost, of the painting. Much later, probably in the 80s, the painting was moved to a new Museum of Culture (I think) in another part of Glasgow. But the setting was not a patch on the original, and besides, Glasgow folk don't like 'their' traditions being messed with, so after much protest, it was returned to its proper home in Kelvingrove. First time I love being called a rascal, hehe! Hugs, G-Ma. I'm only a jack of all trades, G-ma, and not far above. Not far, either, thanks to the internet. I feel you very near, actually. What simple one? You? You have seen it all, G-Ma. Oh, wow, Doghouse! I invited Dan Brown, and I got a better guy: you! That was wonderful! Now, visitors will read your analysis and be inspired! Enthused is the word, I think. Violet, I don't mind this embarassment, thank you! Don't look now, but your kindness is showing. Kenny, don' want to embarass you but I have never met a teacher of art like you! You are indeed a gift to the community; not only do you provide us with great hubs, your kindness in how you treat everyone shines through. As you can see, I am a fan of your hubs. LOL! Once again you have given me an opportunity to ponder the beauty and message of true art. At first glance I tend to shy away from this type of art because surrealistic art is more for the abstract thinker than I view myself to be. Upon taking the time to ponder this piece however, I wonder if to truly enjoy surrealistic art more time must be invested by the viewer. That said I have found by pondering on the beauty of the picture some incredible insights I might have otherwise missed. By noticing the inverted triangle that is formed by Christ and the cross, I have been reminded that the inverted triangle is a symbol of the condescension that a God made to atone for the world, or man. Basically, it is heaven pointing toward earth. The image of the artists self-portrait that is in the knee of the Christ is a suggestion to me that he as accepted Him as his savior, thus &quot;every knee will bow and every tongue confess, that Jesus is The Christ&quot; becomes evident at the placement of the portrait. The positioning of Gala his wife in the position of the triangle looking toward heaven, is symbolic to me of man looking toward God. When those two triangles converge they form the six-pointed star. In the scriptures stars are often used to symbolize endless posterity of those who are faithful to the Abrahamic Covenant. When a husband and wife enter into that covenant together with Christ they have a potential of receiving those promises. The cubes or squares represent to me, the earth or the world, sometimes referred to the &quot;four corners of the world&quot;. I feel that with the amount of these symbols present in this picture it may suggest that the Atonement was infinite and eternal, a gift to everyone. Christs free floating position also suggests that he over came the world. Obviously, I have gleaned a lot from your art classes... for this I am grateful to you.